Pics.io has a flexible billing system that allows you to scale up or scale down your team very easily depending in your needs. In order to invite a teammate, open the Settings menu in the top right corner of the main Pics.io screen and select My Team section. Here you will find three tabs: Teammates, Roles, and Policy. Teammates section shows available information about the team owner and all other teammates alongside with their emails and roles they perform. The two figures divided by slash above the name of the section (e.g. 11/50) refer to the current number of teammates in your team (11) and the number of teammates you are allowed to invite according to your billing plan (50). Here you can also search for certain teammates and invite new ones by pressing Invite new teammate button. To invite a new team member, you need to type in their gmail address and assign a role. A newly-invited teammate will receive an email from Pics.io with a link to complete their registration. Your digital repository stored in Google Drive will be automatically shared with the teammate you have invited. 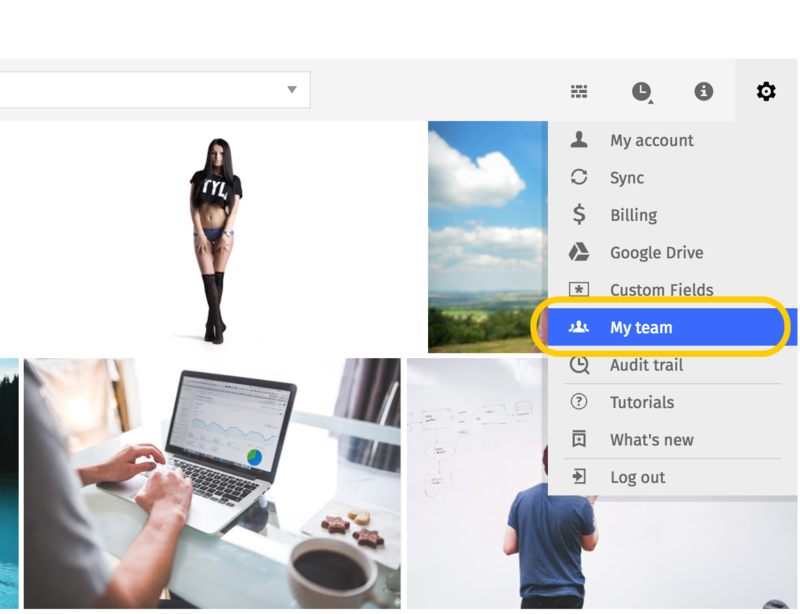 You can also set different roles and permissions in your team to insure the integrity of your digital library.